4 rubber caps to keep unit stabilized and from scratching the surface of the flooring. Give your closet an instant makeover with the Mainstays 10-Tier Narrow Shoe Rack. Constructed with a silver metal frame for maximum durability, this shoe rack is the perfect solution to store all of your favorite footwear while keeping it neat and accessible. With 10 tiers of storage, you can easily organize your shoes based on style or purpose. Sneakers, boat shoes, ballerina flats, flip-flops, heels, boots, slippers, sandals—there is space for it all! Or, assign a few shelves to each family member for easy retrieval. 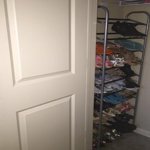 Follow the simple step-by-step instructions to assemble the Mainstays 10-Tier Narrow Shoe Rack in your bedroom closet, mudroom or front hall closet, and you’ll be ready to go. The rack includes all necessary hardware so you won’t have to waste time looking for it at the store and fumbling around with it later at home. Shoe lovers, rejoice! 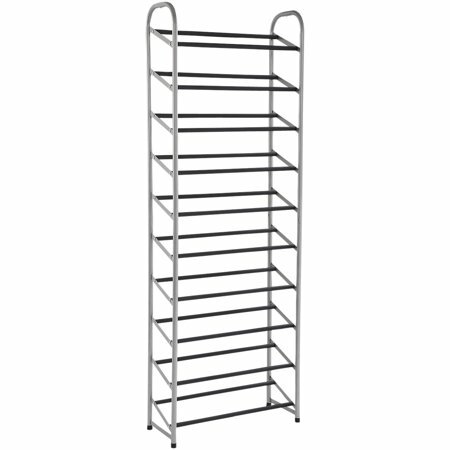 You have finally found a permanent storage solution with the Mainstays 10-Tier Narrow Shoe Rack. This itemail is great. I had one made from plastic that this one replaced because it literally started buckling and falling in on itself but this one is metal and so far seems to be holding up well. I love it. It could be spaced out a few more inches in between each rack, but other than that it is awesome! I don't know why I didn't think of this sooner. It's a great investment and only took me 30 minutes to put together. I'm satisfied with this purchase! Went together simply and my wife was using it fifteen minutes from when I opened the box. Have to think a little when putting it together but no surprises. They even sent a couple of extra screws which was thoughtful. Sure looks like it will last a long time. This is the second time I buy this exact shoe rack. It works great, it's strong enough to hold all 30+pairs of shoes and it fits perfect in tight spaces. I searched high and low all over the web and stores and couldn't find a better deal for a sturdy shoe rack. Good quality with a great price. It was easy to assemble, took about 10 minutes. Wasn't sure how flat shoes would stay since the bars were in a slant but it's a sandy material that doesn't allow the shoes to slide off. Overall I'm satisfied and glad to have bought it. I like how sturdy and well made this shoe shelf is, but i wish each shelf was a little wider. It's hard to fit three pairs on each shelf unless you alternate them facing forward and then backward. This shoe rack is pretty stable considering I have 20 pairs of shoes on it. However it is narrow which I l luv cause I don't have a lot of space just a small corner n the rack fits in the corner nice, very pleased n the price was awesome! If u have aloft of shoes n little space get this one!! I gave the shoe rack 3 stars because it was only useful to hold my flats and sneakers not even my ankle boots or pumps. I wish the rack was more spacious in between rows.